Lawns are a great, low cost, easy maintenance, hardwearing but soft, self-renewing multi-purpose surface, suitable for the busy family. Lawns may be used for physical activities, as a design feature or as a functional path leading from one area to another lawn. Lawns may need edging this can include rope-edge tiles, log roll, bricks, wooden boards or stone, to suit your turfing needs Top Gardeners can lay different types of grass to suit your needs, from meadow to stirling. Whether you’re based near Farnham or Cheltenham, Top Gardeners can help you improve your garden. We can provide regular garden lawn maintenance services throughout the growing season, including mowing with professional mowers, watering, trimming, fertilising, weed killing and rolling. We provide lawn feed, weed and moss killer programmes in the spring and autumn, as well as lawn scarifying, aerating, lawn top dressing and over seeding, if required. 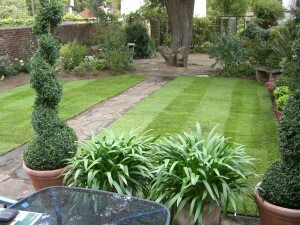 Lawns will be cut to the optimum level, taking account of the weather conditions to produce the best results. After our care, your lawn will be suitable for the smartest wedding or occasion! Whether you’re based around Cheltenham or Farnham, Top Gardeners can help you make an impact on your garden space. We also provide sound advice so you can maintain your own lawns. 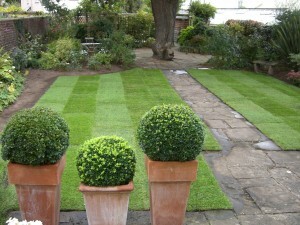 Our top gardeners are based in Farnham and Cheltenham and are always available for quick chat. Why not get in touch and arrange an appointment? Looking for a Gardener in Surrey or Gloucester? Top Gardeners are a young, energetic team of gardeners based in Gloucester and Surrey. We love the outdoors, gardening and helping homeowners improve and enjoy their gardens. Whether big or small, we can improve your little sanctuary. © Copyright Top Gardeners 2015. All Rights Reserved. WordPress Website by GiraffeDog.com.